Farmers Way of Life: Sometimes even no clouds has a silver lining. Part 1. Sometimes even no clouds has a silver lining. Part 1. It's funny how we end up where we are in life. If you had told me ten years ago I'd be full time farming, operate a 20 000 head sheep depot, be part of owning a 670 000 acre pastoral station near Yalgoo, have 12000 sheep and decide that big tractors and burning diesel wasn't for me, I would have politely nodded while speed dialing directory assistance for the nearest looney bin. Ten years ago I had just started a real job. Got a trade, as every farmers son was advised to do back then. So I did. I was halfway through a Building Design and Drafting (with a pen, not a gate) TAFE course when I got offered a job with a local crayboat builder as a drafty. Not knowing anything about boats except that they make me feel crook and catch bugger all fish, I spent three enjoyable and educational years there until I got sick of being in an office. So we went back farming. Hay Paddock, 11th June. It had been in for nearly 6 weeks. Gemma had moved up here by then onto her little home block, 540 acres of lovely country. She looked after her damara stud and managed another farm in Chapman Valley, while I worked on another. In 2005 her mother and father decided to get back into farming and the four of us went into partnership and bought our second farm the other side of Walkaway. We settled in June and it was a mad rush to scratch a bit of crop in to tidy the place up and sort out what little fencing was on the joint. 2006. The new farm was coming along nicely. We had been dabbling in contract feeding for stations on our small block over summer, and had just leased the farm Gemma was managing. We were set. Had the plans, had the finance, had the will. We were going to kill the pig this year. Then it forgot to rain. Now we had only come to the Geraldton area in 2003. Originally I came from Eneabba. If you don't know where Eneabba is, just think back to where your cars radiator exploded in summer along the Brand Highway. Chances are, you were at Eneabba. Gemma and her family were from Three Springs, but I didn't hold that against them. In Geraldton the 2003 and 2004 season had been average, with 2005 the best so far. God's own country, the locals said. God must have been into windsailing and kite surfing, but the rainfall was reliable, the average is 450 mls, 18 inchs. We're on the coast, what could go wrong? ANZAC Day, the traditional start for seeding. Come rain, hail or shine, many wheels start moving after ANZAC day. 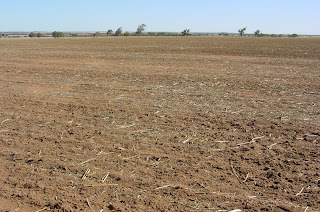 We'd had 30 mls for the year up to the end of March, with not a drop for April, but thats nothing new. The average break according to the pub experts is around the 20th of May. The season is so short up here we've got to get it in early. So away we all went. Diesel burning, dust flying. Green tractors, red tractors or blue tractors, it didn't matter in the end. By the first week they were all one colour. Red Dirt Brown. By the middle of May we started to get a little nervous, but everyone assured us she'd be fine. 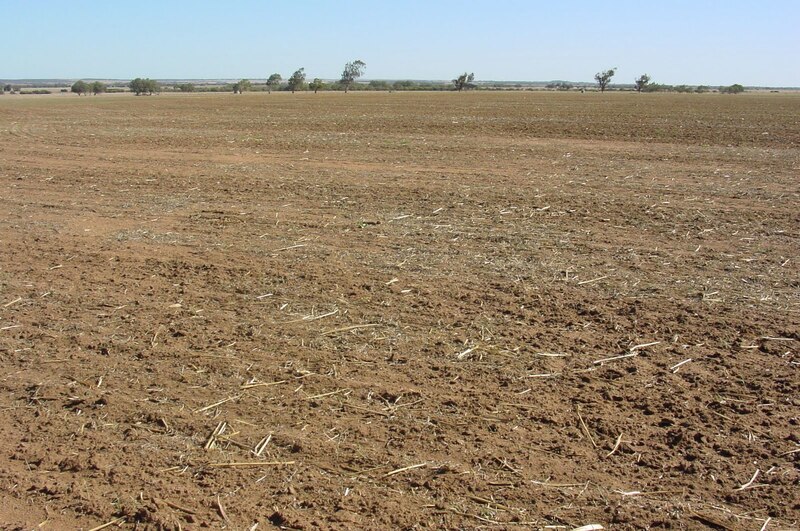 "If it hasn't rained by June then you can start to worry." And sure enough, 23rd of May we got 10 mills. See, worried for nothing, we all said. And kept on buring diesel, pouring in seed and fertiliser and whacking out sprays. By this stage the sheep we had were getting a little hungry, and we had all the lupins in dry, so we pulled up waiting for a germination of weeds. While we were waiting we thought it would be a good chance to stick up a heap of new fence required on the new farm. So we did, seven kilometres of brand new, straight as a die ringlock. By the second week of June we were worrying again. We were debating whether to continue the wheat dry or keep waiting. The decision was made for us. We'd been feeding about 1000 ewes and the 200 cows we'd inherited from the lease block and hay was getting short and expensive. Whilst driving between farms an Agricultural Department expert was being interviewed on the radio about the seasonal outlook. To summarise, he said "There is no rain on the horizon for the next month, and if you haven't finished seeding already I suggest you stop now." Upon hearing that four people in four different locations tried to ring each other at once. Through a mixed muddle of message bank messages, we all met up to discuss our options. Non of which were good. of green in the background? We had the 200 cows we were leasing and their calves on hand, plus the 1000 ewes that were lambing nicely. We'd put in all the lupins, hay and grazing oats we'd planned, but only two paddocks of wheat. The stock paddocks were bare, we were basically feeding all the animals. 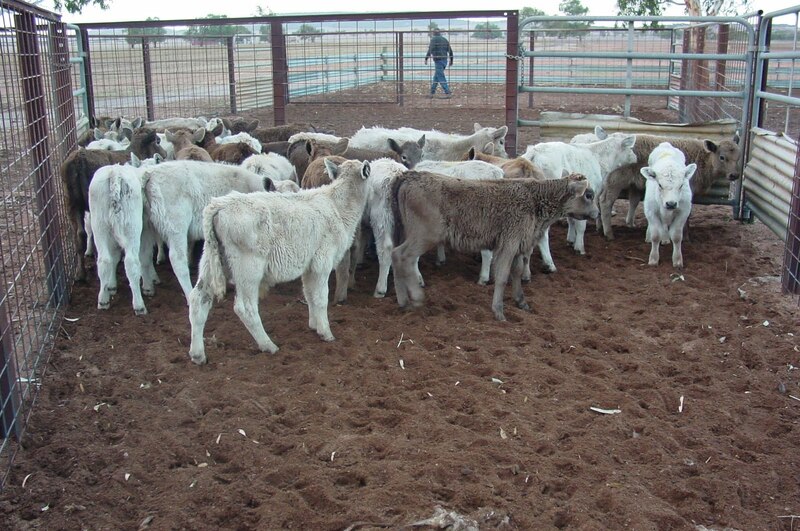 So, we convinced the owner of the farm we were leasing to sell half his cows, and we weaned all the calves into our little feedlot. They were so small we weighed them through the sheep scales. The little ones went onto milk nuts, the mediums onto creep nuts and the handful of bigger ones onto weaner nuts. We never lost a single one, something I am still proud of to this day. We sold any excess ewes we could, but these sheep Gemma bred up from a handful of imported genetics when she first left school, so selling them all wasn't an option. And we parked the tractors up. And prayed. The first real rain came on the 24th of July, 25 mills, followed by another 15 on the 31st. Along with the dribs and drabs we were sitting at 80 millimetres of rain for the growing season to the end of July, and most of that was in lots of 4 or 5 mills, hardly enough to damp down the dust. By now the crops had made a half hearted efforted and a bit of green pick was about for the stock, but it was looking grim. We'll see what August brings, we said, it's got to rain shortly. It didn't. The grand total for August was 27 mills. By now we had turned our stock on to the crops and had renegotieated the farm lease with the owner, who was kind enough to allow us to cancel the lease, something not many would do. But we had unspent finance available and needed a way to get some income to cover losses. Many prime lamb breeders around the area were forced to sell their lambs early. 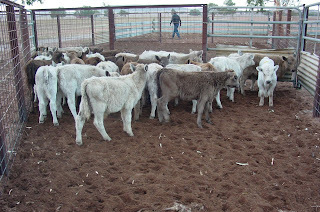 We saw an oppurtunity and bought in a stack of young lambs into our little feedlot. We'd always planned to expand the feedlot, so now seemed like a good time. This is were our lives took an unexpected turn. While picking up some steel from Coolina Holding Yards, an AQIS cattle depot, the owner, Rob Powell, (RIP) asked what we were doing with it. "Building a sheep feedlot," we replied. His ears pricked up. "You should get it registered with AQIS and depot goats. People are always asking me to depot goats and I tell them they can't afford it. I'm not interested in it, but you guys should." So we did. Went through the rigorous process of getting a feedlot AQIS approved and as we were, one of the main WA exporters got wind of it and offered to use us. How we managed that is a story for another time.